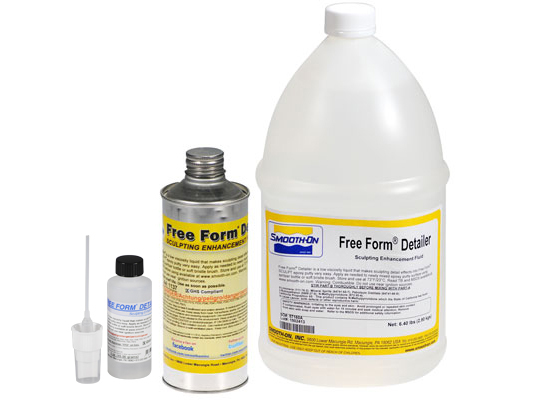 Free Form™ Detailer Product Information | Smooth-On, Inc.
Free Form™ Detailer is a low viscosity liquid that makes adding details and detail effects to the surface of Free Form™ Sculpt Epoxy Putty easy. Control and Precision - Detailer liquid enhances sculpting precision which allows you to quickly integrate dynamic strokes, fine lines, minute, and repeating texture details (such as hair, fur, or feathering). With Free Form® Detailer you can also smooth, stamp, extrude, etc. Detailer keeps putty from sticking to sculpting tools and will not pull or stretch putty. Keeping tools clean means no build up and greater accuracy when sculpting. The more Detailer you apply, the more workable the putty surface becomes; giving you a broader range of possible surface textures and finishes. Applied as a finishing coat, Detailer will leave a glossy surface. Unlike water or general purpose solvents, Detailer does not leave a chalky residue on uncured or cured epoxy and does not affect paint adhesion. Detailer can also be used for clean-up and will help loosen and remove uncured epoxy from most solid surfaces. Directions - To apply, spray a thin layer of Free Form™ Detailer across the uncured epoxy surface before texturing or stamping the Free Form™ Sculpt epoxy putty. Re-apply as necessary. A light spray can also be applied to wood, metal, and some plastic sculpting tools before tooling the Free Form™ Sculpt material. A small scale test applying Free Form™ Detailer for compatibility with your specific tool is recommended before use. When hand applying Free Form™ Sculpt epoxy putty, a small amount of Free Form™ Detailer can be sprayed on to gloved hands to reduce adhesion. If glossy surface is desired, spray a thin covering of Free Form™ Detailer over epoxy putty surface as a finishing coat. Let dry and allow Free Form™ Sculpt to cure as directed.